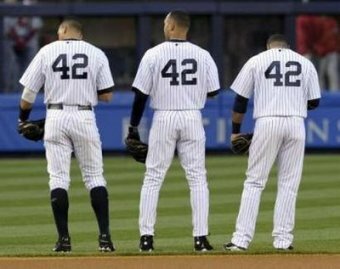 The entire Yankee team wore #42 in honor of Jackie Robinson Day (Photo: AP). Phil Hughes’ long-awaited return to the rotation was kind of an enigma. Although he certainly had good stuff, he was somewhat inefficient, needing 108 pitches over 5+ innings. Strangely, it seemed as if Hughes pitched ahead for most of the night, but then selectively nibbled. For example, after giving up a second inning HR to Hideki Matsui on a 92mph fastball, Hughes only threw him one more fastball in his next two ABs. Still, there was a lot to like. Most impressive was that Hughes used all four pitches (fastball that started around 94 and ended up at 91; sharp curve that he dropped in for strikes; biting cutter that elicited a number of missed swings; and an occasional change). If the Yankees can get Hughes/Posada to remain aggressive and not waste pitches when ahead, he’ll have the potential to dominate. A 9th inning misplay (ruled a hit) by Derek Jeter cost Joba Chamberlain his second career save. However, if both Hughes’ and Chamberlains’ roles hold, and the Yankees best expectations for them are realized, that combination could figure prominently over the next several years. On the other hand, Scott Kazmir exhibited rapidly diminishing stuff over the course of his 4+ innings. After starting out with a mid-90s fastball, Kazmir ended the game throwing around 87mph. Perhaps it was the lingering effect of the sore right hamstring, but then again, Kazmir has seemed to be undergoing a gradual decline. Robinson Cano continued his hot hitting with 2HRs. It was Cano’s 5th multi-home run game, and first since April 25, 2009 against Boston. Derek Jeter’s third inning HR extended his hitting steak to 9, tying his longest such string to begin a season (2006). Robinson Cano also extended his season long hitting streak to 9. Both Jeter and Cano are now halfway to Alex Rodriquez’ franchise record of an 18-game hitting streak to begin a season (2007). Curtis Granderson’s two triples represented the fifth time he has accomplished the feat. Granderson’s last 2-triple game was on August 18, 2008 versus Texas. The last Yankee to hit two triples in a game was Bobby Abreu, who did so at the Metrodome on May 30, 2008. The last player to hit two triples at Yankees Stadium (old and new) was Enrique Wilson on July 3, 2002 against Cleveland. The Yankee record for most triples is three, held by Joe DiMaggio (August 27, 1938 versus Cleveland) and Earle Combs (September 22, 1927 versus Detroit). Granderson also starred in the field by throwing out Hideki Matsui at home plate in the fourth inning. The replays showed that Matsui actually slid under the tag of Posada, who set up behind the plate. Hideki Matsui slides under the tag of Jorge Posada, but is called out by Home Plate umpire Jerry Layne (Photo: AP). In the third inning, Arod used a hard slide to break up a potential double play ball off the bat of Robinson Cano. Even though the Yankees didn’t capitalize on the resulting 1st and 3rd situation, the play illustrated Arod’s all around hard style of play, something not always forthcoming from a star of his magnitude. Francisco Rodriquez made his major league debut for the Angels by pitching the bottom of the 8th. No, it isn’t 2002. The Angels new “K-rod” is a 27-year old career minor leaguer.